Among those sailing articles reserved exclusively for super-yachts, we also find "accommodation ladders" by the Italian company Sanguineti of Chiavari. 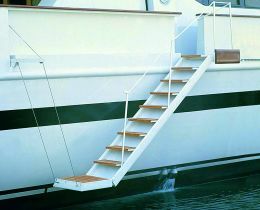 Accommodation ladders serve the purpose on larger boats of facilitating boarding and leaving the boat by the owner and guest both when at anchor, and so to and from the tender, or when berthed alongside. The models offered by the company Sanguineti Chiavari include the model "King", made to measure, so that it folds away into the bulwarks. 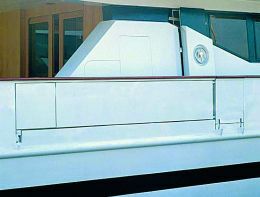 It has a light alloy and stainless steel caisson structure, with solid teak slats for the rungs and platform at the base. The ladder is electrically controlled. The whole system includes a steel cable, a controlled arm and an electric winch for assisting handling of the ladder or gangway as it is also called. The company also makes a jointed model, with a double profile parallelogram structure completely in anodised light alloy with self-levelling rungs and platform in natural teak. This model is available in the standard version with manual handling or with an additional kit for electric control. The latest model to be to join the range of products is an oleodynamic rotating ladder, caisson structure, rungs and lower platform in light alloy, upper platform, articulated joint and fixing to the boat in stainless steel. All the underfoot surfaces are in teak duckboard. This ladder has oleodynamic folding, leaning and rotating actions. 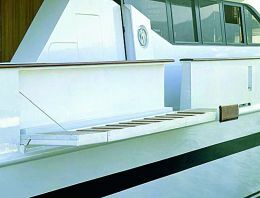 The oleodynamic accommodation ladder has a particularly elegant design that goes well with more modern super-yachts. For those wanting something more classic and traditional, Sanguineti offers a classic style manually operated accommodation ladder, made entirely in solid teak, while for those not requiring cutting edge technology, there is also a manually operated fixed rung accommodation ladder. For further information: Sanguineti Chiavari; via San Rufino 31; 16043 Chiavari (Genoa); tel. +39 0185 363324; fax +39 0185 313731; website www.sanguineti.com; e mail sanguineti@sanguineti.com.